I was looking through my cookbook collection the other day, and rediscovered a favorite from my pastry school days: The Modern Baker by Nick Malgieri, founder of the baking program at the Institute of Culinary Education. Sadly, the book seems to no longer be in print, but there are used copies available on Amazon. The recipes produce restaurant-quality baked goods yet are simple to follow. Case in point: this chocolate babka. I’d always found the prospect of making these chocolate-filled, brioche-like loaves a bit daunting, but Nick’s recipe makes the process seem manageable. 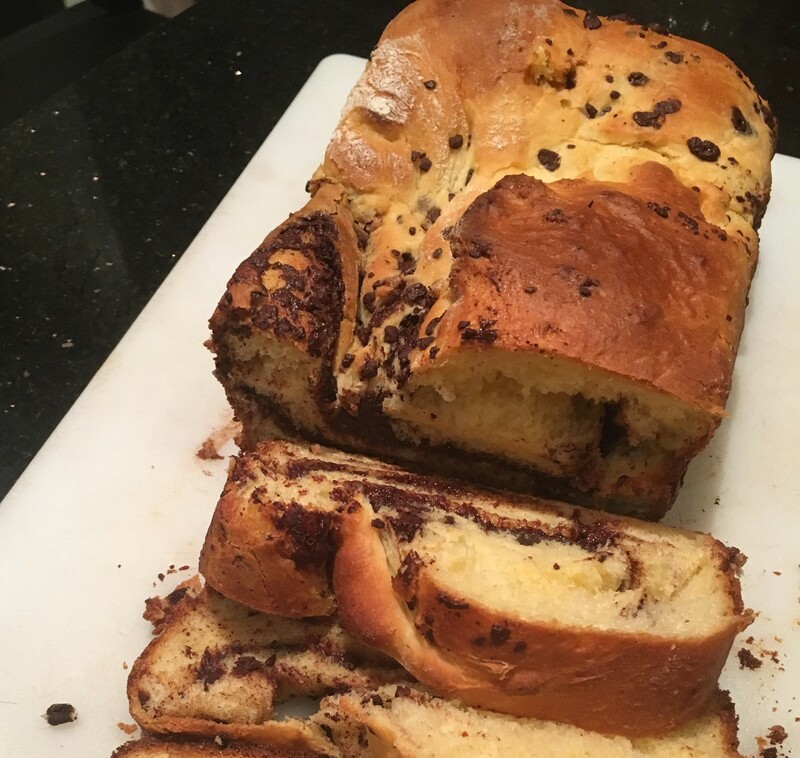 In fact, after I finished spreading on the filling and rolling up the dough, it occurred to me that babkas are prepared much like cinnamon rolls, which I’ve baked many times. My other favorites from The Modern Baker include lava cake and focaccia topped with caramelized onions, olives, and anchovies. Note: I adapted the directions slightly, tweaking some of the wording and adding instructions for mixing the dough by hand. Warm the milk in the saucepan until it’s lukewarm, about 110 degrees. Pour the milk into the bowl of an electric mixer and whisk in the yeast (or pour into a mixing bowl and whisk by hand.) Whisk in butter, sugar, egg yolks, vanilla, and salt. Using a rubber spatula, stir in half the flour. Add remaining flour 1/2 cup at a time, beating on low speed if using the electric mixer, or with a rubber spatula if mixing by hand. When all the flour has been added, beat the dough (or mix with the spatula) for 2 minutes. Stop and allow the dough to rest for 10 minutes. Beat on low to medium speed (or mix with the spatula) for 2 minutes more. Empty the dough into a buttered bowl and turn it over so that the top is buttered. Cover bowl with plastic wrap and refrigerate for 1.5 hours. In the meantime, prepare the filing. In a food processor, combine chocolate with sugar, cocoa powder, and cinnamon. Pulse until finely ground. Set mixture aside. After the dough has chilled, place it on a floured workspace and press it out into a rectangle about 10 x 15 inches. Evenly scatter the chocolate filling over the dough, and then scatter on the chopped walnuts. Roll the dough up jelly-role style from one long side, and punch ends to seal. Use a knife to cut the role into 2 equal pieces. Butter and line the bottoms of two loaf pans with parchment paper. Invert each roll, seam side down, into a loaf pan. Cover the pans with towels, and let them rise until doubled in bulk, about 1-2 hours. About 20 minutes before babkas have fully risen, set a rack in the model of the oven and preheat to 350 degrees F. Bake about 45 minutes, until deep golden. Cool in the pans for 10 minutes, then unmold and let cool on their sides to prevent collapsing.